Ducklings Day 8: Today, Discoverers and Pioneers came to visit the ducklings in our classroom. 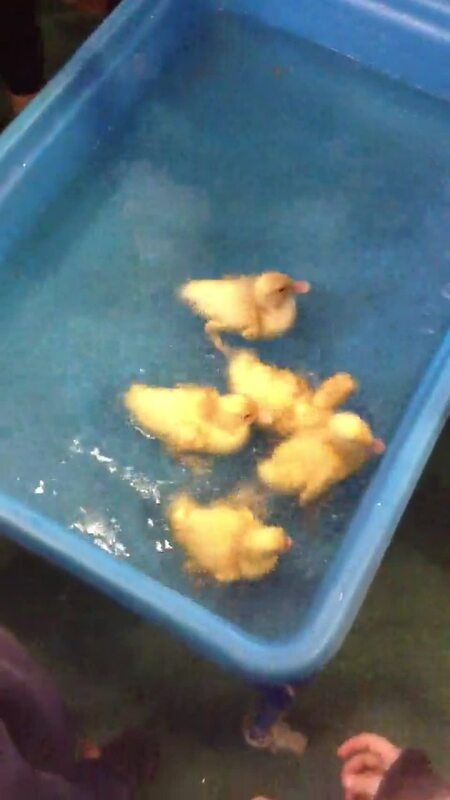 Once all of the children had gone back to their own classes, we filled up our water tray and made a swimming pool for the ducklings. I don't know who was more excited, the children or the ducklings. They definitely made a splash! What an exciting morning we had today! All of the eggs had finally hatched so we could move the ducklings into the brooder cage! Sonny the first duckling moved last night and three of the other ducklings joined him this morning. The final duckling was born not long before school started so had to stay in the incubator until lunchtime before he was moved to the cage with the others. Parents will be invited into class to see them next week when they are more sociable and lively. Please check Ponsbourne Post for the days to come in. What an exciting day we have had today! About 2.20 this afternoon, our first duckling hatched! Unfortunately we didn't see him come out of the egg but we saw him just after. We decided to call our first duckling Sonny as he is yellow and the sun was definitely shining today! The children will be thrilled to see that another duckling egg hatched during after school club. He is drying out in the incubator and will be able to join the other duckling in the cage in the morning. We don't know if the ducklings are boys or girls, but we have gone with the pronoun 'he/him' for them as they are more likely to be male than female. Spring 2: We have some very excited children in class this week. We have had a very special delivery...DUCKLING EGGS! 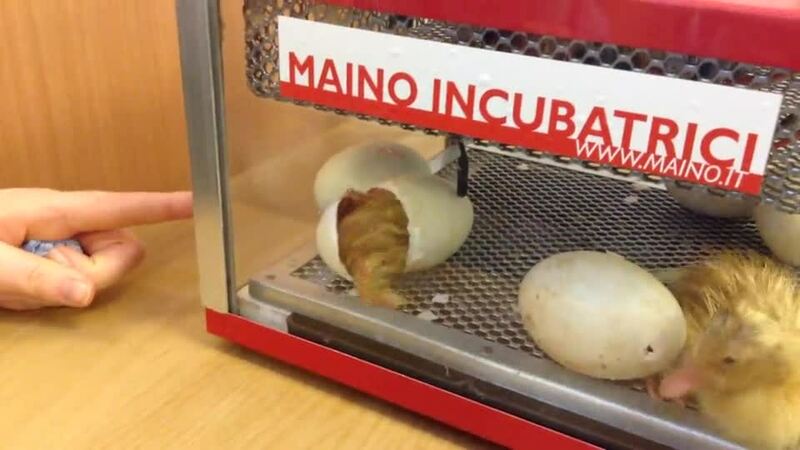 We have 5 eggs in our incubator and we are eagerly waiting for them to hatch. We have all made a prediction as to which egg we think will hatch first. Keep an eye out for photo updates on our page. Spring 1: The children had great fun on Thursday coming to school in yellow, as a farm animal or as a farmer. Mrs Stubbs even wore a duck hat! 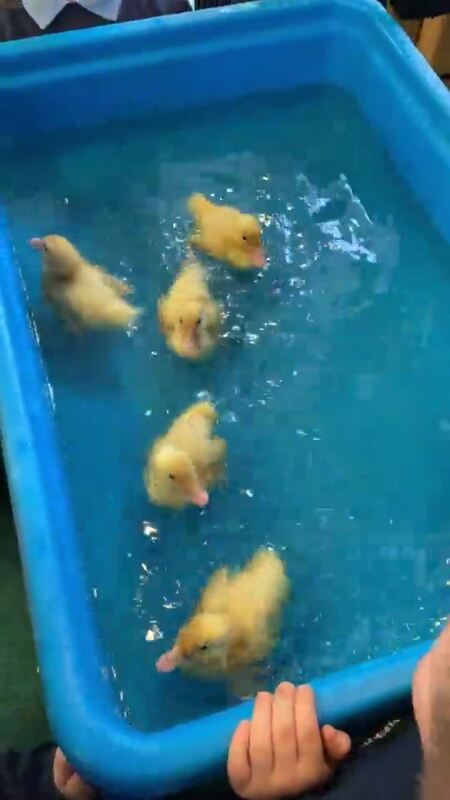 We raised £57 towards our ducklings that will be arriving after half term. Spring 1: The Reception children enjoyed our cooking session this week where we made pizzas. The children were shown how to use a knife safely and they then spread their tomato sauce onto their base. They then chose their topping and scattered them on their pizzas. Spring 1: We were very excited to see the snow this week. The children really enjoyed playing outside and they even built a snowman with the help of Mrs Sahbaz.! Unfortunately he didn't last very long as he was needed for snowballs! We hope that you all had a great Christmas and have come back to school, ready to learn and show off your knowledge! Forest School will continue to be on a Wednesday morning so children will need their wellies. Reception reading books will be changed every Wednesday. Library books will be changed every Friday for all children. It was great to have all of the children stay at school for their Christmas Lunch. We had Christmas songs playing, Christmas Crackers and lots of dancing afterwards. Reading books were sent home this week. We will be changing them once a week to start with. Please read with your child every night and record this in their Reading Record. Once we feel that they are reading fluently, we will ask them to choose a new book. We have set aside time to do this each week and we will make sure that their books are changed when necessary. As the children become more confident with their reading, we will change their books on a more regular basis. Please continue to look at the library your child has chosen also. Autumn 2: The Reception children continued to bring their Christmas spirit into the classroom on Friday afternoon. We spoke about snowmen and what happens if they get too warm and the children could tell me that they would melt. This gave us inspiration to make Melting Snowman biscuits. Have a look at our photos. Autumn 2: Christmas has officially landed in Adventurers! The children did a fantastic job at decorating our tree for the Christmas Tree Festival, which know takes pride of place in our classroom. Our classroom is now looking very Christmassy after the children helped to cover our classroom in tinsel, baubles and glitter! Autumn 1: For this year’s Living History Day, the children were learning about toys from when their grandparents were children. They came in dressed as their grandparents would have dressed and brought in toys that their grandparents would have played with. Autumn 1: Every afternoon, before we go home, we learn about something new with Auntie Mabel and Pippin (the dog) on Come Outside. The children were curious as to how to spell Pippin so we made some resources for them to use. There were lots of happy faces and fantastic letter formation! Autumn 1: The children of Adventurers made some lovely cakes for our Bake Off for Macmillan. They were all very tasty and looked amazing! We raised lots of money for the charity so we are very proud of ourselves. Autumn 1: Forest on the Village Green. This week, instead of going to the forest in school, we decided to go on an adventure, over the road and onto the Village Green. We went looking for conkers and pine cones to use in school but had a surprise when we also found lots of acorns! The children have had a great time in Adventurers this week. We have all been exploring our new classroom and finding lots of things to do. Some of the children discovered the Water Area outside and spent lots of time racing boats and catching as much water as they could. There were plenty of tea parties in our Mud Kitchen, as well as our outdoor role play area. Some of the children had lots of discussion about their diggers and what they were digging and going to use the sand for. Welcome to the Adventurers Class Page! Myself, Mrs Stubbs, Miss Ellis, Miss Kearns and Mrs Sahbaz hope that you all had a fantastic summer and are ready to come to school! Forest School will be on a Wednesday morning so children will need their wellies. The End of Summer 2018: We finished with a Superhero BANG! Summer 2: Our School Trip! Summer 1: The Stone-age and Geography Week! Spring 2; We boarded the train at the beginning of the week and we enjoyed the snow for the rest! Spring 2: Chinese New Year! Spring 1: Happy Half Term! Spring 1: Our trip to Tesco with Farm to Fork! Wow! We are so impressed and proud of how well Nursery and Reception have settled into their first week at school. The children have been busy getting to know their environment and each other. Reception are being fantastic role models for Nursery and helping them to get to know their classroom. Our Topic for this half term is 'My Family'. Please can children bring in a photo of them and their family which you are happy for us to display in the classroom. Reception will begin their Phase 2 phonics sessions next week and we will be sending home flashcards and a letter with some more information about Phonics. I will also be inviting parents in to observe a phonics lesson towards the end of the half term in order to support your understanding and how you may be able to support your child at home. Nursery will be sent home with a library book that will be changed every Friday. We will also send home some information of the importance of reading with your child and other ways to use story books. Due to allergies within our classroom please could we ask that no items are brought in that may contain egg, sesame or chickpeas. Thank you. Tapestry: Tapestry is the program we use where you can access your child's learning journey. I have set up accounts for all of our new children and you will receive an email from Tapestry to activate your account to view your child's profile straight away. Please let me know if you do not receive the email or you would prefer me to use a different email. Please note, I have used the emails provided to the school office. Please take this opportunity to set up the 'all about me' page with your child as this also provides us with valuable information. Existing parents should be able to access Tapestry as normal and can also fill in the 'all about me' page. Please do not hesitate to approach us with any questions. Wow, where has this year gone?! We are so proud of all the children and they have proven what little stars they are from their performance in the summer Concert this week! Thank you to all the parents for getting them to look so fantastic in their outfits. We had a great time on our school trip to the Celtic Harmony Camp on Thursday and the children experienced what it may have been like in pre historic days with no electricity!! Another big thanks to the parents for arranging your child's transport to and from the camp. Look out for the photos on the class page of the school website. We have really enjoyed teaching Adventurers this year and would like to wish Reception our best wishes, who are ready to spread their wings to Year 1. I am really looking forward to watching Nursery flourish in their next year to come and being positive role models to our new Nursery children. Thank you for all of your support in school and at home with your children and we really appreciate your generosity with your gifts. Have a great summer and we look forward to seeing everyone refreshed in September. Nursery have been learning the sounds in Phase 2 phonics and so far we are up to 'p'. We have been exploring different objects and words that have the 'p' sound in them. See if your child can find something around the house that begins with 'p' or has that sound in it and let us know on Tapestry. Reception are continuing to work on Phase 4 in phonics, where they learn to look and listen out for the 'consonant clusters' in words. I will put some phonic work on Education City this week so please remember to have a look. If you need the log in please do not hesitate to ask. Thank you for all your support at home. In maths, Reception have been looking at money and learning the different coins and their values. See if your child can recognise the coins in your purse or wallet. Lots of them have told me they have hundred of pounds at home. Please can parents/carers encourage their children to line up before they come into the classroom in the mornings so that the children come in independently. This has been working really well for the children and ensures that they settle quickly (and discourages any upset from parents staying too long). All the children are still extremely enthusiastic about our topic and we have continued to explore activities that develop the children's understanding of people who help us. Unfortunately, our visit from the Police has been moved back to next Wednesday but we had an exciting visit from the Paramedic who spoke to children about his job role and the children asked some great questions which we had prepared. Please remember water bottles with names (that should not be in book bags) and to name all your child's clothing, especially now it is warm and children are taking their jumpers off. Can all children please have a spare set of clothes in class as we have limited supplies and the weather is unpredictable. Adventurers have been enjoying the warmer weather this week and have spent lots of time outside being physical. They particularly liked playing with the parachute and trying to keep Michael the Monkey on it! Reception have been further exploring doubling, halving and sharing. We will continue to explore these topics until the end of term. Most children should have some knowledge of how to double up to 10 and sharing between 2 groups. We have arranged some special visits for the children next week following our Superheroes and People who Help Us topic! On Tuesday, we have a visit from the Police and on Friday we have a visit from a Paramedic. Please could we have any padlocks with keys that you may have laying about the house that you are not using anymore! We have a number of exciting uses and activities we could use them for, for the children! Welcome back everybody! Adventurers have returned refreshed and ready to learn! We have spent the last couple of days catching up with all of the children's exciting Easter news and we been sharing all the children's voices in small groups. All I can say is, so may Easter eggs!! Nursery have really impressed us this week with how well they coped with staying all day and having lunch at school. This is fantastic preparation for Reception. We would also like to take this opportunity to say that we are looking forward to welcoming the children into Reception and we will be supporting them in their transition into our school or their new school. Our pirate themed week was a hit with all the children this week. We have observed some fantastic pirate role play and there has been lots of writing opportunities with writing messages in a bottle and 'Wanted' posters. We look forward to finishing the week with a treasure hunt, where the children will be searching for 'gold coins' on Friday! We are sure pirates will be making another appearance before the end of the year. Next term, our topic is Baby Animals!! Chosen by the children. This will fit in nicely with the arrival of our chick eggs that will arrive on the 13th of March which is our science week too. We have been very lucky in Early Years and have invested in some good quality picture books for our Guided Reading sessions in Reception. We will be sending an extra book home over the half term week which should be returned the first week back to school please. We will also be sending home some resources to support some children in their phonics, handwriting or maths which can be enjoyed over the half term. Thank you all for another great half term. We hope you have a restful but fun week. We are continuing with the story Goldilocks and the Three Bears next week. The children are continuing to use mathematical vocabulary such as small, medium and big to identify different sizes in their play. See if your child an identify different sizes around the home. We look forward to seeing all parent/carers on 10th February 9am for our “We’re going on a bear hunt” story in Pie Corbett style. If someone else is dropping your child off to school in the mornings, please let them know that the children need to be lined up at 8.50 and come into school independently. Also please make sure that you leave the school premises promptly, as KS2 have Wake and Shake in the school playground. Uniform: All indoor shoes should now be in school after being returned to you before Christmas to check for sizing. Please remember the importance of having everything clearly labelled to avoid losses and mixed up clothing. Please label water bottles too. We would like to invite all our parents/carers to watch the children perform the story,'We're Going on a Bear Hunt'. This will take place around 9am on FRIDAY 10th and will last for about 10 minutes. Adventurers have had a good first week back and they all seem so grown up! We have got stuck into our new topic Bears which was chosen by the children. We will aim to read a number of stories around bears and this will lead into the children's Child Initiated Learning as well as lots of other activities. We have begun by reading and acting out the story 'We're Going on a Bear Hunt.' Which the children have really enjoyed and we hope to show all parents/carers towards the end of this half term. We are putting a big focus on 'measurement' in maths this term and hope the children's vocabulary and understanding will flourish. We will be looking into height, weight, capacity and length. Please continue to look at our website for photos to support this. In Nursery phonics we are focusing on rhythm and rhyme. We have been singing lots of nursery rhymes and the children have been identifying objects from the ‘mystery bag’ that rhymes, such as, dog and log, bone and phone, snake and cake. Please support your child’s understanding of this by trying to find anything around the house or on your outings that rhyme. Reception are doing really well in phonics as we are well into phase three now. They will have a new set of sounds to learn and tricky words that will have been sent home this week. So far we have learnt, 'j, v, x, w, y, z, zz & qu'. Thank you to all the parents that have brought in items this term to support our role play and learning resources. The children have had a special week and we are definitely feeling in the Christmas spirit! We are sure that you will agree that they did fantastically in their Nativity play! We look forward to seeing the children in their Christmas jumpers next Monday in exchange for some chocolate for the tombola at the Christmas Bazaar. Adventurers have had a busy but exciting week this week. We went to Church for our first Nativity practice and the children all did really well singing and speaking loudly. Reverend Pauline showed us around the Church and spoke to us about the birth of Jesus and why we perform Nativity plays around Christmas in theme with our RE week. Reception visited Jenny at the Post Office where they posted their letters to Santa! Jenny showed and spoke to them about the Post Office and the jobs she has to do. Please could we have boxes (cereal, cereal bars, toothpaste) any shape or size for the children to wrap in our Santa's Workshop Role Play next week. We would also appreciate any wrapping paper, bows and tags. Thank you. The children are in full swing practising for our Nativity play. Singing the songs through their snack time and Child Initiated Learning. We have been generously given a Christmas Tree and decorations by Mr & Mrs Stanners that we have put in our book corner this week. The children are really enjoying being read to and having some quiet time around the tree. Well done to all the children that are now coming in independently. It is having such a positive impact to the start of the day and we are really proud of them. We are encouraging the children to come into school independently. Please help us by arriving on time (8.50am) and ask your child to join the line to come into class. Late arrival may unsettle your child as they have to come in alone. Please continue to check in on Tapestry to see what your children have been doing at school and please remember that you can also update your own observations that they have been doing at home. This could be a trip out at the weekend, something they have enjoyed playing or something new that has happened. We are beginning to practise for our Nativity play which will be held in Church on the 16th of December. We will be sharing your child's role in the play in the following week. Autumn Term 2: We have been having lots of discussions as a whole class this week about 'what makes a good friend?' and 'how can we be good friends to each other?' in relation to well being week, with a focus of anti bullying. We have also been focusing on 'night and day' as part of our 'Winter' topic. The children have been exposed to lots of stories about the dark. Such as, Funny Bones, Can't you sleep Little Bear? and 'Why do Stars Shine at Night?' We have been asking the children lots of 'when' questions, such as, 'When do you brush your teeth? When do you go to sleep?' See if your child can distinguish between some of the things we do at night time and in the day time. Reception have completed all the sounds in Phase 2 and we are now revising and recapping their learning through reading and writing CVC words, captions and sentences. Please can we have lots of cardboard tubes (kitchen rolls, wrapping paper, tin foil). We are looking for items for our writing area! We will be making a post box for next week going from the children's interests and would like birthday cards, invitations, envelopes and anything else you would like to contribute. Please can all children come in independently in the mornings. Please say good bye to your child before they line up and encourage your child to line up and come into the classroom as a whole class. TAPESTRY: Tapestry has been updated and you will now need to log on to a different web address which is tapestryjournal.com The Tapestry mobile app will work with both the updated and original version of Tapestry. We hope that you do not have any problems but if you do, please do not hesitate to share with MIss Busson. The children have settled back into school well and have got stuck into our 'Winter' theme where we have been focusing particularly on The Arctic. See if your child can tell you something about the Arctic. Nursery are continuing with Phase One phonics and they really enjoyed listening and guessing the noises that our 'Noisy Neighbour' made. The children haven been using vocabulary such as, 'banging, tapping, patting and clapping' to distinguish between different sounds. Reception were very excited to start their handwriting this week which we have been doing in fun and engaging ways. Such as, using our interactive board and individual white boards. This week we practised 'c' and will continue with letters that have a similar pattern such as, 'a,o,d,g,q,e,s,f'. We call these the culy caterpillar letters. The children have enjoyed DT week this week and we have seen some fantastic models. We have had castles, rockets, treasure boxes and cars! you can see these photos on our website. Nursery are continuing to use their listening skills in Phonics and we have been distinguishing the sounds between different instruments. We will continue this to next week and the children will know the names of some instruments and have some vocabulary of how describe the sounds they make. Reception have a great understanding of all the sounds we have learnt so far and next week we will be moving onto 'h' and 'b'. We are still practising blending which is to draw the individual sounds together to pronounce a whole word. We will send home a set of two letter words (in, it) which children should be confident with before moving onto three letter words (can, had). Your child is confident when they can see the word and say what it is. We are so impressed with their recognition of the tricky words so far and next week will be learning both 'no' and 'go'. Please remember our 'Join me Learn' next Friday morning where you can come in with your children and engage with our 'Funky Fingers' session that supports and develop children's fine motor skills. This session will run between 8.50am-9.20am. Looking forward to seeing you then. In DT Week next week, Adventurers will be exploring lots of Junk Modelling materials and will be taught different ways to join materials together and how they can enhance their models to give the best outcome. We will make models such as rockets, boats, instruments and anything the children may think of. Nursery have had an exciting start to Phonics this week and really enjoyed using their ‘Listening Ears’ to identify the different sounds in their inside and outside environment. The children have been introduced to vocabulary to describe the sounds they hear, such as, ‘loud, quiet, and soft.’ We will be uploading observations to Tapestry and the Website for you to see this in action. Please continue to check Tapestry to see what your children have been up to at school and share this with your child. You can also leave comments for feedback and upload your own observations of your children at home. Reception have learned the word ‘I’ this week and have really mastered all three Tricky Words so far. They are also doing well in their independent reading with a Teacher and we are now also doing Guided Reading twice a week to enhance children’s word recognition and comprehension further. Please do comment in your child’s reading record when you have read with them and their book will be changed on a Monday or a Tuesday when they are ready. Nursery are doing so well in the morning and getting used to the routine. If your child feels confident to come in independently in the morning, please encourage this and say goodbye before coming into school. We apologise for the confusion of home time with Nursery parents in the last few weeks. Now the scaffolding has been removed, we will be bring the Nursery children to the gate at the right of the school (next to the old main entrance) at 11.55. Adventurers will be baking cakes for the Harvest Appeal on Thursday. Please send in £1 on that day, and they will return with their delicious creations. We would like to invite all Adventurers parents to 'Join me Learn'. This is where you will get the opportunity to spend some time getting involved in your child's learning. We will be focusing on 'Funky Fingers', which the children do first thing when they come in the mornings and these activities support and progress their Fine Motor Skills. We will be holding this on Friday 21st October from 8.50am - 9.20am. Nursery will be going to church on Monday morning for the first time in preparation for Harvest Festival on Friday. Another great week for Adventurers, All children are settling well in the mornings and getting used to our routine. Please can all Nursery children bring in a book bag which you can purchase from the office and then we can send home a library book every Friday. Please can your child have their library book in their book bag on Fridays so that we can change them. We will not be able to change them until you bring the book back into school. Reception have been doing really well in phonics this week and we have looked at 'c' and 'k'. The children are really interested that these letters make the same sound but look different. We have looked at lots of words that begin with these either 'c' or 'k'. We have continued to look at the tricky word 'to' this week and we have added this flashcard to your child's Phonics Pack. Please continue to practise the sounds at home and do not hesitate to ask any questions. Next week we will be looking at 'the'. (please can Reception keep their phonics packs in their book bag so we can add to them to keep everything together.) Reading books will be changed every Tuesday. Please make sure wellies are in school and everything is labelled. Do also check your child's Tapestry profile which you should all have received an email to log on. Observations will be added weekly. Adventurers have settled fantastically into their first week. Reception are doing a great job looking out for our new children and showing them where everything is in their classroom. Our Topic this term is 'My Body'. We will be discussing lots about our senses, how we grow and things that we like and dislike. Nursery who have book bags in school have been given a library book that will be changed every Friday. Please could all Nursery children bring in a book bag so that they can take a book home and things they have made in school. Reception have been recapping learnt sounds in phonics so far and our tricky word this week was 'to'. Please support your child in identifying this word in the environment and when reading books. We will be giving out reading books and reading records next week that will be changed at least once a week. From Monday please can we ask that Reception parents say goodbye before coming into school and encourage your child to line up independently. Please can we have spare uniform to keep at school including underwear and socks. We also need wellingtons to keep at school for Forest school every Friday.